Putting on the Brakes | All Around Dogs Putting on the Brakes | Thoughts on training and life with dogs. Dog training folks are known for their habit of transforming everyday items into dog training equipment – gloves and socks as scent articles, traffic cones as training targets, etc. I had already “borrowed” the tow chains for Aaron’s truck to use as drag chains for Dash’s pulling, but then it quickly became too easy for him. So I had to figure out a way to give him something heavy. We’re less than 2 weeks from his first trial and I’ve got to get him used to working through the frustration without food. 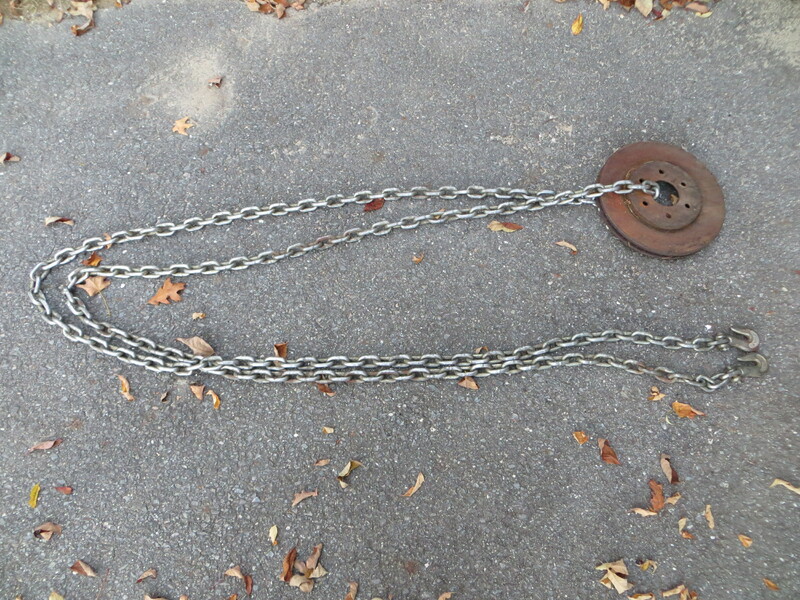 The chain is about 20′, adding enough length to be a challenge for Dash would have been cumbersome for me to manage. Then I remembered that we had two ugly rotors sitting in the garage from the last time Aaron changed my brakes. We couldn’t put them out with regular recycling and hadn’t gotten around making a special trip to turn them in. I toyed with putting both on but I figured the extra drag was going to add a lot more than the literal weight, so I stuck with just one. As it turns out, this is just right. We need to work through his frustration when he can’t get moving right away and this has just enough drag to force him to really dig in to get things moving. If he stops, he’s got to bear down all over again, which obviously annoys him. He still needs some edible encouragement, but his offered effort is moving in the right direction.